When using infographics there are a lots of possible solutions. Your creativity has no limits when using infographics. Even for designers producing a good infographic can be quiet challenging. Remember: He Who Dares, Wins!! Here we have collected some tips for you how to create an easy infographic. Find a software you like to work with. Links to suitable software you find in the DISCOVER section of this chapter. Before starting to use software, try to imagine what it could look like. You could draw a sketch on a piece of paper. You could also search the internet for ideas. Use pictures that clearly say what you want to say. Use suitable pictures for your audience. Ask yourself: who do I want to address? What kind of pictures does my audience like to look at? Check the licence right of your pictures. You can learn more about this in the next chapter 5.2.2. “What do you think I want to show in this infographic?” Test your infographic on a friend or family member. Ask them for improvement. The higher the importance of your infographic, the more opinions you should gather. Neil Patel is the Chief Evangelist of KISSmetrics and blogs at Quick Sprout. If you want to use pictures that you find in the internet to publish, for example for a study work or on social media, you need to know how to find pictures with the correct license rights. Who is the owner of a photo? The moment you take a photograph, you own the copyright to it. Can I use photos that are published in social media for public presentations? Content that’s published online is still protected by copyright law. If you’ve ever downloaded images from the net and republished them, used them in posters or newsletters without permission, you may have been breaking the law. Creative Commons allow the owner to select permissions she/he wants to give to people, for free. With Creative Commons licensing you can give away all rights to your work, or just some of them. The most common licensing is an Attribution license, which lets anyone use your image in any way they like, as long as they give you credit. How can I find out about usage right on Google? What do I need to do if I want to use a picture and the licence right is not clear? You should contact the original rights-holder for permission. Only use it if you have a written allowance. You want to learn more about Creative Commons? You own great pictures and presentations you would like to be available for reuse by others? We will teach you the 7 Creative Steps to create an infographic. Let´s look at an example how to create an infographic. There are blue bars to show the likes of female students and red bars to show the likes of male students. It is easy to see the preferred diets. 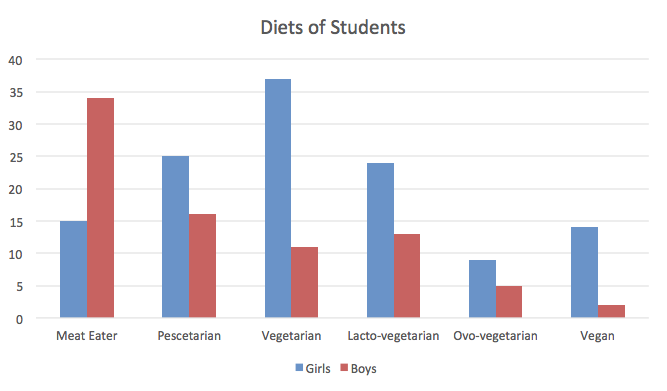 Immediately you find out that most female students are vegetarians whereas male students prefer meat. If you want to go further into detail you can look closer and read the numbers. This graph is good, if you look for specific information. But if you, as creator of the graph, would like to make more people interested in your data, a good tip is to use pictures. When we see pictures that we can relate to – such as food in our case – we are far more likely to look at data. Associate for each item a meaningful picture (creative moment). Then create or find them. In our example we could use a picture of meat to represent omnivores and a picture of fish to represent the diet of Pescatarian. Creative step 2: Use a software that you can handle. We used Powerpoint as it is fairly easy to create with pictures and add word and numbers. Creative step 3: Find a way to show large numbers and small numbers. Use the size of pictures to show the importance: big pictures represent big numbers, small pictures represent small numbers. In our case we use circles of different sizes to show if a larger or smaller number of people prefer a diet. We added the letters “m” for males and “f” for females and the numbers of persons following this diet. We chose a light green. On this background is a good contrast to our pictures. In our case it could be “Omnivores vs. Vegetarians”. Creative step 7: Save it as a presentation and then as picture in a jpg. What information can you get out of this infographic? Immediately we can grasp that the creator wanted to say something about different kinds of food diets and how eating habits can be divided into differerent groups, which move up from a small group (vegan) to larger groups (eg: vegetarian, pescetarian) by adding different food groups. Using the picture, different words are explained as well as just a statistic. Now it is clear that a lacto-vegetarian eats vegetables and fruits like a vegan, but also cheese and milk – even if you do not know the meaning of all words. 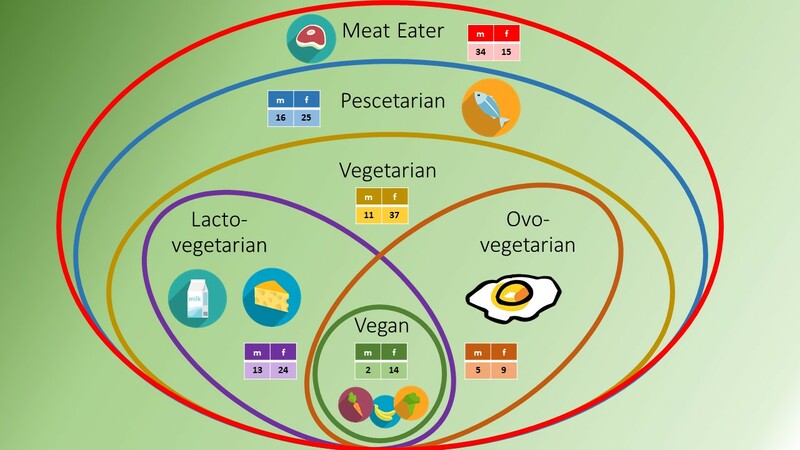 What can you interpret that Ovo-vegetarians eat? Ovo-vegetarians include eggs as an animal product in their diet to supply their body with animal fat and animal protein – but they renounce diary products. In this infographic it is less important to read the different likes according to gender. If you are interested, you can read the numbers – so everything our creator wanted to show is there. Which of the 7 Steps did we not follow? Go back and have a look? Do you manage to find the mistake? There is no title in this infographic! To learn to use PowerPoint or another presentation application there is only one way: GIVE IT A GO! This 7 minute video tutorial will help you. 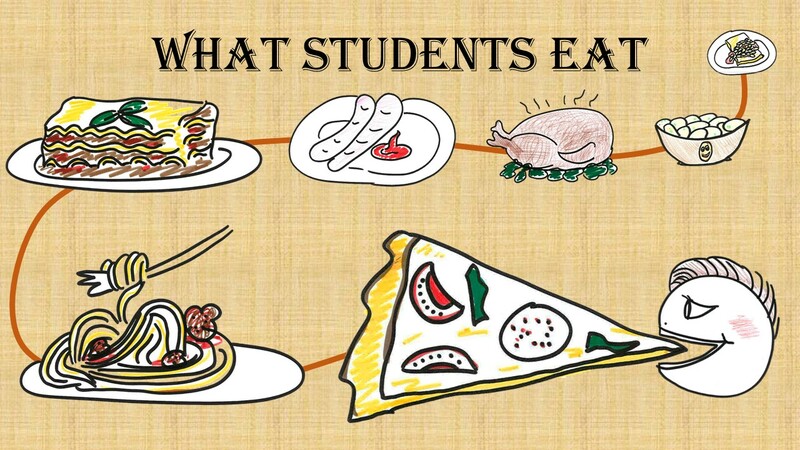 Let´s try and create an infographic for the following data using Powerpoint for the following data about Students’ food likes. 60 Students in a school have been interviewed about their food likes. Creative step 2: Use the templates that come with PowerPoint and keep it simple.